Bailey is the littermate to Manny (Aeros Darkman) and several other dogs we have placed recently. He was the best racer of the litter so was the last to retire. A minor muscle injury forced his retirement from racing recently. This is very minor and will not cause any permanent problem for Bailey and if he had been a better racer they may have rehabbed him and had him continue racing after he healed. His trainer describes him as a real lovable guy. When he comes in from his turn outs every day he always goes up to his trainer for a pet and a kiss before going on to his crate. His trainer thinks Bailey will make a better pet than racer. 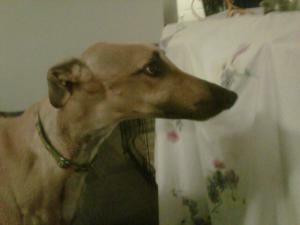 Bailey was raised by breeders that hand raise only one litter of racing greyhounds a year. He has been well socialized and already knows what it is like to be a pet and clearly loves people. He passed his cat and small dog test at the track so should be OK to live with either. His foster home has both and will do further testing.